Humans have descended from an evolutionary branch that includes divergent species such as Australopithecus africanus, which lived around 3 million years ago, and Homo erectus, which lived around 1.5 million years ago. But the discovery of Homo naledi, a new species named by an international team of anthropologists, could lead to a greater understanding of our ancestral family tree. In October 2013 a group of recreational cavers were exploring a valley near Johannesburg, South Africa, known as the Cradle of Humankind for the many ancient human fossils found there. While traversing the Rising Star cave system, the group of cavers noticed a skull at the bottom of a chamber one hundred feet down, accessible only through a crack about eight inches wide. Maneuvering into the chamber, the cavers realized the chamber floor was littered with bones. They took video and photos, and brought the evidence to paleoanthropologist Lee Berger, a professor at the University of Witwatersrand in Johannesburg. Berger was elated by the find, and called his friend and colleague John Hawks to share the good news. 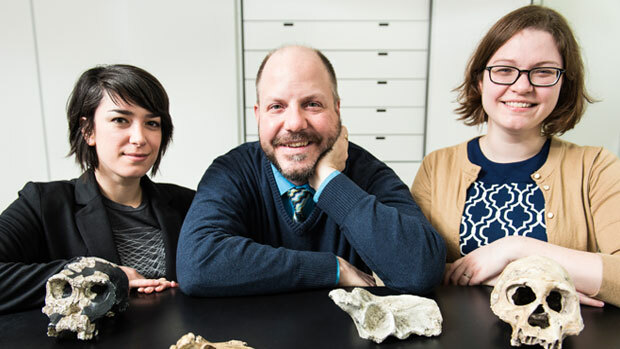 An expert on paleoanthropology and the Vilas-Borghesi Distinguished Achievement Professor of Anthropology at UW—Madison, Hawks joined Berger in quickly assembling a team of experts, including archaeologists that could fit into the narrow cave opening. UW–Madison anthropology graduate student Alia Gurtov was one of six diminutive paleoanthropologists selected by Berger for the excavation crew. Under the guidance of Berger and Hawks, Gurtov and five colleagues spent a month collecting 1,500 fossils—teeth, bones, and bone fragments—from at least fifteen individuals. “It was like pick-up sticks,” says Gurtov. Berger named this ancient hominin Homo naledi after the word for star in the local Sesotho language. Yet, because discovery site does not contain any animal remains or plant matter, Berger and Hawks do not know when Homo naledi lived. “Knowing where and when [our] ancestors lived informs us about what we share, what makes us human,” says Hawks. Caroline VanSickle, a UW–Madison postdoctoral fellow in anthropological biology, is one of thirty scientists comparing the fossils to other early human samples under Hawks’ supervision. From the data gathered so far, scientists believe Homo naledi was likely a great long-distance walker, and given its powerful hands and a broad thumb, very good at climbing. “They walked upright,” says Hawks. “They [were] very thin, very skinny looking,”—traits we wouldn’t typically envision when we think of early human ancestors. As the team continues to study and learn from the discovery, they hope to find out where Homo naledi fits in within the early human family tree, and explore the cultural implications that a burial site may have on our understanding of human evolution. Elysse Lindell is the outreach and data coordinator for the Wisconsin Academy, supporting donor development as well as outreach and communication. Born and raised in the Kettle Moraine area of Wisconsin, Elysse is a recent graduate from the University of Wisconsin–Madison in 2014 with a bachelor's degree in Anthropology.